After Effects for Designers teaches design students, artists, and web, graphic, and interactive designers how to design, develop, and deploy motion design projects using Adobe After Effects. Author Chris Jackson balances fundamental aspects of time-based design with related techniques, and explores the principles of animation; composition and layout; visual hierarchy; typography; cinematic storytelling; 3D modelling; compositing, and more. Each chapter contains unique, step-by-step project exercises that offer timesaving practical tips and hands-on design techniques, teaching readers how to effectively use the tools at their disposal in order to conceptualize and visualize creative solutions to their own motion design work. 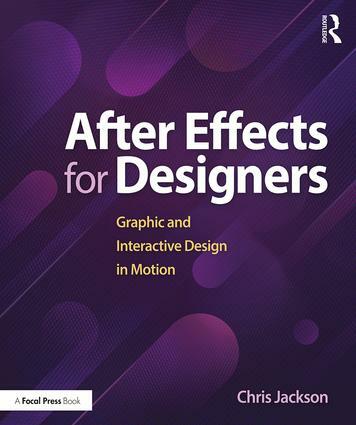 Readers will build professional-world examples in every chapter and, as a result, learn how to both design effectively using After Effects and practically apply these skills in client-based work. An accompanying companion website includes complete project files for the book's chapter exercises, and additional video tutorials.